Contact granulomas are benign lesions usually located on the posterior third of the vocal fold, which corresponds to the vocal process of the arytenoid cartilage. Contact granulomas may occur unilaterally or bilaterally. Granulomas of the larynx can be classified into 2 general groups: specific granulomas and nonspecific granulomas. Specific granulomas are rare and include granulomas caused by tuberculosis  and syphilis. 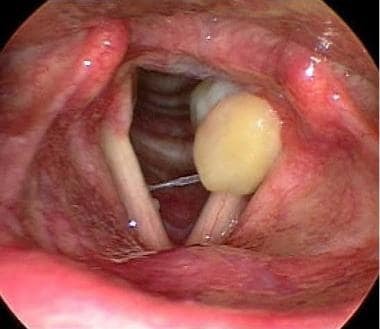 Nonspecific granulomas are benign and are unilaterally or bilaterally located on the vocal processes of the vocal folds. Histologically, they resemble pyogenic granulomas. Left vocal process granuloma on initial presentation (scope view of 70°). Contact ulcers (or granulomas) historically were thought to be the result of voice abuse or misuse, and the granulomas of intubation or gastroesophageal reflux were separate subsets of these conditions. However, for all purposes, the appearance, symptomatology, and treatment of these nonspecific granulomas are identical; therefore, both subsets of nonspecific granulomas can be considered a single entity. A contact granuloma is a pale or sometimes red mass located on the medial aspect of the vocal process of the arytenoid cartilage. Histologically, contact granulomas resemble pyogenic granulomas, which consist of chronic inflammatory infiltration with neovascularization and fibrosis covered by squamous epithelium. Classic contact ulcers are thought to be the result of vocal misuse and abuse. With this etiology, the lesion most commonly is identified in men. These lesions often are similar in appearance to those found in patients after intubation (intubation granulomas) and in patients with gastroesophageal reflux. Occasionally, a vocal process granuloma is identified in a patient for whom none of these factors are apparent. de Lima Pontes et al label this group idiopathic. The literature contains much confusion about this entity; however, for practical purposes, these lesions may be conceptualized as a group. This patient was evaluated for hoarseness after prolonged intubation. The lesion resolved with observation and proton pump inhibitor therapy. Video courtesy of Vijay R Ramakrishnan, MD. Factors that contribute to the development of contact granulomas include smoking, allergy, infections, postnasal drip, and chronic throat clearing. Psychosocial traits associated with development of contact granulomas include aggressive personality, introversion, depression, emotional tension, and/or cancerophobia. Certain dietary factors may affect the laryngeal milieu, leading to a detrimental mucosal environment. These factors include consumption of caffeine, chocolate, alcohol, peppermint, spicy foods, and tomato products; high-fat diet; poor water intake; and use of tobacco products. However, a direct causal relationship in the formation of contact ulcers has not been established. Differential diagnoses include carcinoma, granular cell tumor of the larynx, and sarcoid. Contact granulomas are usually pale, pedunculated masses found on the medial or superior edge of the vocal process of the arytenoid cartilage; however, they may also be deep red, lobulated, and sessile. These lesions may be 2-lipped structures that fit the vocal process of the opposite side. Contact ulcers occur when the thin mucosa overlying the firm cartilage of the vocal process is crushed repetitively against the opposite side, causing a breakdown of the mucosa. An ulcer forms, accompanied by granulation tissue formation. An object such as an endotracheal tube may cause the injury leading to granulomas, or granulomas may result secondary to chronic irritation (eg, persistent gastroesophageal reflux injury). Apices of the arytenoid cartilages are composed of elastic cartilage, and the rest of the arytenoid cartilage is hyaline cartilage. The arytenoid cartilages begin to ossify at approximately age 30 years. Ulcer or granuloma occurs on the vocal process of the arytenoid cartilage. The vocal process accounts for the posterior third of the vocal cord where the vocal ligament attaches. The mucosa covering the vocal processes of the arytenoid cartilage is a thin layer of stratified squamous epithelium. This thin layer of mucosa is susceptible to being crushed between any unyielding object (eg, an endotracheal tube, the opposite arytenoid) and the firm cartilage beneath the mucosa. Surgery is discouraged as the initial management for 2 reasons. Surgery is associated with a high recurrence rate of 37-50%, which often leads to multiple surgeries that may still be unsuccessful. Surgery may also cause the granuloma to migrate, following the wound edge. Beham AW, Puellmann K, Laird R, Fuchs T, Streich R, Breysach C, et al. A TNF-regulated recombinatorial macrophage immune receptor implicated in granuloma formation in tuberculosis. PLoS Pathog. 2011 Nov. 7(11):e1002375. [Medline]. [Full Text]. Jackson C. Contact ulcer of the larynx. Ann Otol Rhinol Laryngol. 1928. 37:227-30. Jackson C, Jackson CL. Contact ulcer of the larynx. Arch Otolaryngol. 1935. 22:1-15. Li J, Tian S, Zou S, Wang Q, Tai X, Chen X. CT Study of the Arytenoid Cartilage in Patients with Laryngeal Contact Granuloma. Otolaryngol Head Neck Surg. 2017 Dec. 157 (6):1013-6. [Medline]. Ayazi S, Lipham JC, Hagen JA, Tang AL, Zehetner J, Leers JM, et al. A new technique for measurement of pharyngeal pH: normal values and discriminating pH threshold. J Gastrointest Surg. 2009 Aug. 13(8):1422-9. [Medline]. Yılmaz T, Kayahan B, Gunaydın RO, Kuscu O, Sozen T. Botulinum Toxin A for Treatment of Contact Granuloma. J Voice. 2016 Nov. 30 (6):741-3. [Medline]. Lee SW, Hong HJ, Choi SH, et al. Comparison of treatment modalities for contact granuloma: a nationwide multicenter study. Laryngoscope. 2014 May. 124 (5):1187-91. [Medline]. Jin YJ, Lee SJ, Lee WY, Jeong WJ, Ahn SH. Prognostic factors for prediction of follow-up outcome of contact granuloma. Eur Arch Otorhinolaryngol. 2014 Jul. 271 (7):1981-5. [Medline]. Vocal process granuloma 2 months after initiation of antireflux therapy and speech therapy intervention in a patient who initially presented with left vocal process granuloma (scope view of 70°). Vocal process granuloma 4 months after initiation of antireflux therapy and speech therapy intervention (scope view of 70°). Flexible endoscopic view of contact ulcer in a patient upon presentation. The patient underwent surgical resection with recurrence prior to referral. Resolution of contact granuloma 5 months after intensive antireflux therapy, speech therapy intervention, and botulinum toxin injection into left vocal fold (flexible endoscopic view). Note the small, red, residual spot. 24 hour pharyngeal pH probe study revealing moderate increase in acidity (decrease in pH) below 5.5 during the night.